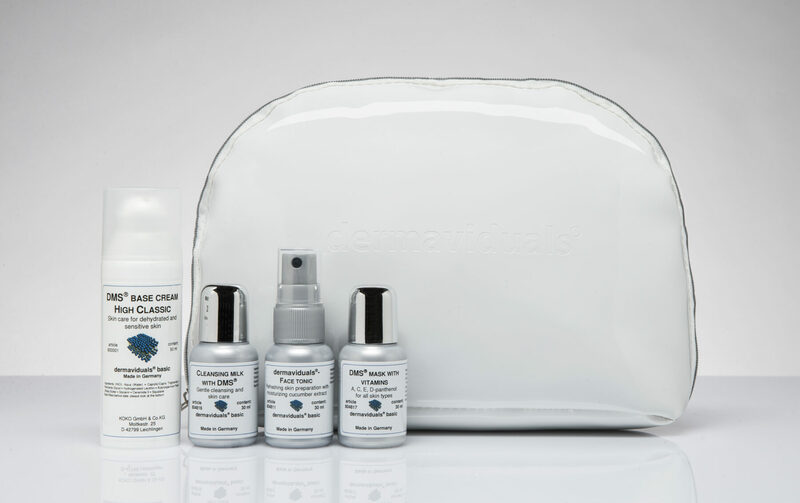 The dermaviduals Travel Kit contains all of your skincare essentials in a handy cosmetic case: DMS Cleansing Milk 30ml, Face Tonic 30ml, DMS Mask with Vitamins 30ml & DMS Base Cream 50ml. Whether you are jetting off overseas or road tripping an hour away we can make sure you arrive (and leave!) looking fabulous. DMS is an integral factor to achieve desired skin health – the specific composition of physiological lipids and membrane technology allows it to mimic the structure of the skin. It protects and replenishes the acid mantle, hydrates and restores the skins barrier and also allows for better penetration of active ingredients. 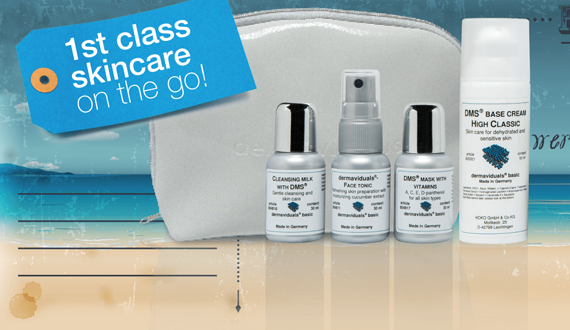 DMS is found in three of the four products in our Travel Kit: Cleansing Milk, Mask with Vitamins & the Base Cream. The DMS Cleansing Milk is a gentle skin identical cleanser that gives back to the skin, what travelling takes out. The non-irritating formula easily removes dirt and makeup, leaving skin feeling clean and nourished. Ideal for travel, this cleanser can be used without water and just tissued off. Face Tonic contains calming cucumber extract and regenerative D-Panthenol. It is the perfect tonic to prepare the skin for the penetration of active products and provide further hydration, in any climate. Tip: Use as a refreshing spritz on long haul flights to revitalise tired skin. Our Mask with Vitamins will turn any hotel room into your own personal spa. This luxurious leave-on mask or night cream will tackle oxidative stress, as it is designed to rebalance all skin types and nourish environmentally damaged skin. It contains the DMS components along with a combination of Vitamins A, C, E and Provitamin B5 (D-Panthenol) in the form of liposomes and nanoparticles. Use a pea size portion for application to the face after using Face Tonic. The Base Cream in your Travel Kit is determined by your skin type. All base creams mimic the structure and function of the skin and provide protection and hydration whilst aiding the penetration of active ingredients. Your dermaviduals skin treatment therapist will help you decide whether Classic, High Classic or High Classic Plus is suitable for you and your destination. Find your closest stockist here.